“Instant Problem Solving—Guru Inside” Every day we Boston devotees pass this sign as we chant the holy names in Harvard Square. The sign hangs on a local shop window, and it is sold in quantity inside. This week at the neighboring movie theatre a new movie is showing—The Guru. So who is the guru? The true guru is the person who says that Krsna, God, is our true friend. He does not pose himself as God or tell us that we can become God. The bona fide guru has various qualifications, and someone who is looking for a spiritual master must know the standards that the true guru must meet. Today everyone is posing himself as a spiritual master or guru, and so we have that facetious sign. One group of foolish persons thinks that they can become gurus by their own concoction, simply by proclaiming themselves spiritual masters. And a corresponding group of foolish persons accepts such phonies because the formula is so easy, offers so much sense gratification, and supposedly permits the practitioner to become God. They like to think that in an instant their problems will vanish, and thus they are cheated. Despite such foolishness, there is such a thing as a bona fide guru or spiritual master, and the sincere student of spiritual science should know how to recognize him. One should understand who the spiritual master is, what his position is, how he can be identified, and how we relate to him. And one should know the ultimate goal in accepting a spiritual master. Simply stated, the ultimate goal of spiritual life is to develop love of God, and the duty of the spiritual master is to awaken this dormant love of God in the hearts of his students. The spiritual master is a servant of the Supreme Lord. Thus the student becomes the indirect servant of God, and if a student serves God sincerely, God will ultimately reveal Himself to the student in a pure loving exchange. This process is described in Bhagavad-gita and is recommended as the highest yoga by the Supreme Lord Himself, Sri Krsna, the original spiritual master. So in real spiritual life the spiritual master acts as the via medium between us, so minute, and Krsna, so great. We are so limited that we cannot approach the unlimited God, but the spiritual master, out of his causeless mercy, makes himself available to help us approach the Supreme Lord. The spiritual master has completely surrendered to God, and God has revealed Himself fully to such a pure devotee. The spiritual master acts as a via medium between ourselves, who are contaminated by our association with matter, and Krsna, God. In this sense the spiritual master is even more merciful than God, since he comes and reveals himself to the conditioned soul who is still contaminated by material association. But since the spiritual master is pure in his surrender to God and the will of God, he is, in a sense, one with God. Thus the student who comes to hear and love the spiritual master also comes to develop knowledge and love of God. Of course it is the mercy of God to send the spiritual master, and then it is the grace of the spiritual master to deliver God. As stated in Bhagavad-gita, the process for going back to Godhead is simply to engage in devotional service to God. But how can we, who are so minute and actually helpless, do anything for God, who controls and owns everything? The answer is to serve the spiritual master. It is like this: Suppose one knows a very, very rich man. What can one do to please him? Nothing. He has everything, and in comparison we have nothing. But suppose the man has a son. Then simply by giving a small piece of fruit to the son, one can please the son, and when the son is pleased, then automatically the father becomes pleased. So in this way one can please a very rich man. The spiritual master is very dear to Krsna, just as a son is dear to the loving father, and by pleasing the spiritual master one can please God Himself. In Bhagavad-gita, the Supreme Lord states, “There is no servant in this world more dear to Me than he, nor will there ever be one more dear.” (Bg. 18.69) So Krsna has feelings, and He dearly loves the spiritual master. In fact, as stated in the Srimad-Bhagavatam, Third Canto, the Supreme Personality of Godhead is thinking, “There is no way I can ever repay My pure devotees.” When a man walks barefoot in the blazing sun, his feet are scorched, but his head feels no pain. Similarly, although He may tolerate offenses to Himself, Krsna tolerates no abuse to His pure devotee. As stated in Srimad-Bhagavatam, Third Canto, “They captivate My heart who are gladdened in heart; they look upon the brahmanas [holy men] as My own Self and pacify them by praising them in loving words, even as a son would appease an angry father or as I am pacifying you.” So by serving the spiritual master we can please the Supreme Lord and thus go back to Him, by His divine grace. In this connection another example may help. Suppose you know of a very rich, famous, or distinguished personage and want to gain entrance into his house. You cannot go to his home and say. “I make $200 a week so let me in.” No—$200 a week or $500 a week or $1000 a week is nothing to him. You have no qualification of your own. But it you have the favor of one of his associates or servants, then by his desire you may enter the rich man’s home. Similarly, the intimate associate of the Lord is the spiritual master, and the Lord is anxious to please His pure devotees. The relationship between the Lord and His devotee is transcendentally beautiful. As a devotee is elevated in all good qualities due to his being a devotee of the Lord, so the transcendental glories of the Lord are increased due to His being devoted to His servitor. In other words, as the devotee is always anxious to render service to the Lord, similarly, the Lord is very anxious to render service to the devotee, the bona fide spiritual master. With confidence in this relationship, the student, out of love, agrees to serve the spiritual master. There is no question of force. Where there is force, there is no love. Our spiritual master, His Divine Grace A.C. Bhaktivedanta Swami Prabhupada, once said, “If a father calls his son, ‘Come here!’ and there is no love, the son will either refuse to come, or he will come reluctantly, thinking secretly, ‘How can I get back at my father?’ But if I say, ‘Satsvarupa, come here!’ you will come immediately, out of excess of love. Is that no right?” Satsvarupa, one of Srila Prabhupada’s students, immediately nodded his head—”Yes!” Thus the service rendered by the student to the bona fide spiritual master is performed out of love. Anyone who sees His Divine Grace Srila Prabhupada with his disciples is seeing the perfection of family life. The mother, the Vedas, directs the child to the father, the bona fide spiritual master, as illustrated so personally in the Gita. Arjuna, who had very great spiritual qualifications as well as material qualifications, still confessed to Krsna, the supreme spiritual master: “Now I am confused about duty, and I have lost all composure because of weakness. In this condition I am asking You to tell me clearly what is best for me. Now I am Your disciple, a soul surrendered unto You. Please instruct me.” (Bg. 2.7) By nature’s own way, the complete system of material activities is a source of perplexity for everyone. Vedic wisdom therefore advises us that in order to solve the perplexities of life and to understand the science of the solution, one must approach a spiritual master, for a bona fide spiritual master is supposed to know everything. Furthermore, the Vedas set forth the qualifications of the bona fide spiritual master. The first requirement for the bona fide spiritual master is that he be in the line of disciplic succession from the Supreme Lord Himself. Not just anyone can qualify as a spiritual master, nor should the student accept anyone to be a spiritual master simply on sentiment. Sri Krsna is the original spiritual master, as stated in the Srimad-Bhagavatam: dharmam tu saksad bhagavat-pranitam: “The path of religion is directly enunciated by the Lord.” The bona fide spiritual master teaches the transcendental science, as first enunciated by the Lord, as it is, without concoction or alteration. He is able to do so because he understands the purport of the Lord’s teaching from the disciplic succession descending directly from the Lord. The knowledge mercifully given by the Lord is like a perfect fruit passed down from the top of a tree. The fruit must be passed delicately. If someone drops the fruit, or lets it fall, or in any way mishandles it, then the whole fruit is spoiled. If the bona fide spiritual master is in the line of disciplic succession from the Supreme Lord, he is careful to pass the fruit of Vedic wisdom to us without personally motivated interpretation. The conclusion of all Vedic knowledge is that Sri Krsna is the Supreme Personality of Godhead and the goal of all yoga, knowledge and sacrifice. All the great saints and sages in our line of disciplic succession, the Brahma-Madhva-Gaudiya Sampradaya, beginning with Sri Krsna and including Brahma, Narada, Vyasa, Lord Caitanya, Srila Narottama Dasa Thakur, Srila Bhaktivinode, Srila Bhaktisiddhanta Sarasvati Gosvami Maharaja Prabhupada, and finally His Divine Grace A.C. Bhaktivedanta Swami Prabhupada, have personally realized and taught Krsna consciousness. If the result of a process is good, then the process itself must be good. These great saints and acaryas are unmatched in spiritual realization so the process of God realization first spoken by Krsna and passed on through the disciplic succession is also matchless. The second requirement of the bona fide spiritual master is that he speak only on the authority of the Vedas or of his spiritual master, so that the disciplic succession may be kept rigidly in line with the original teachings. The spiritual master never invents ideas or processes for self-realization, but always goes to the higher authorities. He is aware of the limitations of the minute living entity and his small mind and imperfect senses, so he similarly teaches his students to speak only from the higher authority. Even the Supreme Lord Himself does this. 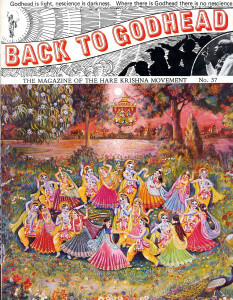 In the Bhagavad-gita, Chapter Thirteen, Verse 4, Krsna states, “That knowledge of the field of activities and of the knower of activities is described by various sages in various Vedic writings, especially in the Vedanta-sutra.” Of course, Krsna is the Supreme Personality of Godhead, the ultimate source of all the Vedas, and the supreme authority on all matters, but still He cites the accepted spiritual literature. Lord Krsna teaches by example how the bona fide spiritual master always gives evidence from previous authorities. That is the process. Similarly, Lord Caitanya, who was also the Supreme Personality of Godhead, accepted a bona fide spiritual master in the line of disciplic succession, and He always quoted His spiritual master. The spiritual master and student alike strictly follow the line of disciplic succession and the Vedic authorities, so others who are interested in spiritual life should follow this process too. People are so prone to indulge in transitory speculation, even when they are to educate themselves on areas beyond their empiric jurisdiction. People so often mistake these illusory experiences, especially when influenced by a drug or “meditative” process, for genuine spiritual realization. They so often have “inspirations,” “visions,” “experiences” and “revelations” which are merely the concoctions of a limited and deluded mind. The person interested in spiritual life should therefore be very wary of his own personal messages. God, Krsna, is in our hearts as Paramatma, Supersoul, and thus He can speak to us. But there are parallel tracks—God on the inside and spiritual master on the outside—so the religious seeker must confirm his inner realizations by the authority of the spiritual master on the outside. This dual confirmation is very important; one must go to the spiritual master. The third requirement of the bona fide spiritual master is that his knowledge is realized. He must be a pure devotee of God, teaching by example, practicing what he is preaching—not that he teaches dry theory or philosophy. In the Bhagavad-gita, Sri Krsna describes the characteristics of His pure devotees, and by these characteristics one can recognize a bona fide spiritual master: “He who knows in truth this glory and power of Mine engages in unalloyed devotional service; of this there is no doubt. I am the source of everything; from Me the entire creation flows. Knowing this, the wise worship Me with all their hearts. Their thoughts dwell in Me, their lives are surrendered unto Me, and they receive great satisfaction and bliss, enlightening one another and conversing about Me.” (Bg. 10.7-9) “They are always engaged in chanting My glories. Endeavoring with great determination, offering homage unto Me, they worship Me with devotion.” (Bg. 9.14) These are the characteristics of the pure devotees. The bona fide spiritual master is always in ecstasy of love of God, having realized who God is, who the self is, and what is actually the relation between the Lord and the living entity. The bona fide spiritual master is in a direct relationship of loving reciprocation with the Lord, and he fully accepts the Lord in His personal form. As stated above, the mahatma, or great soul, is always engaged in chanting the glories of the Supreme Lord Krsna, the Personality of Godhead, with no other engagement. That means that he must glorify the Supreme Lord, praising His holy name, His eternal form, His transcendental qualities and His uncommon pastimes, and he must pass on such information to his students. The bona fide spiritual master does not dwell on the impersonal Brahman feature of the Supreme Lord, in which the ananda or blissful aspect of loving exchange with the Supreme Person is missing. The spiritual master, being completely attached to the Supreme Person, is not attracted to material or bodily affairs. He understands that he is not this body but is pure spirit soul, part and parcel of the Supreme Person Krsna, and that his position is of loving service to Krsna. Therefore he is always joyful and free of anxieties, neither hankering nor lamenting about material affairs. He is self-satisfied, atmarama, and transcendental to the dualities of material life. His eves are always wet with tears of love for Krsna, in fully realized knowledge of Bhagavad-gita. And, as stated in the Gita itself, such a great soul is very rare. Once a student of His Divine Grace A.C. Bhaktivedanta Swami Prabhupada said to Srila Prabhupada, “Prabhupada, you look so sad in this picture.” And Srila Prabhupada replied, “No, that was a moment of ecstasy.” Who can imagine the ecstasy of one who is in direct contact with Sri Krsna? His Divine Grace A.C. Bhaktivedanta Swami Prabhupada has all the qualifications of a bona fide spiritual master, and he is always in contact with Krsna, the all-attractive person, the supreme friend. His Divine Grace needs nothing but engagement in transcendental loving service to Lord Krsna, and that he has all the time. So what need has he of us? He has no desire to accumulate wealth, nor any desire to enjoy beautiful women, nor does he want any number of followers. He wants only the Lord’s causeless devotional service. He has come to the West to spread this divine message only out of his causeless mercy upon us, in service to Krsna and his Guru Maharaja, pouring the shower of his mercy on all the dried-up souls of the universe. The fake spiritualists are puffed up with notions of their own power, and they often think that they are God. “I am God, a dog is God, everyone is God.” Or they say, “All is one. We are actually God, but we are now under illusion.” If God is under illusion, then illusion is greater than God. And if everything is God, then our everyday meditation on dog or wife should be sufficient to give us liberation. Clearly these pretenders are not God, and His Divine Grace A.C. Bhaktivedanta Swami Prabhupada urges everyone not to accept cheap gods and fake spiritual masters. The story is told of one so-called spiritual master who was on the stage in an auditorium sitting in so-called yoga and saying, “I am moving the sun, I am moving the moon.” But he had to leave the stage because he got a toothache. So is he God? He claims to be moving the sun and the moon, but he cannot stop a toothache. Another charlatan spiritual master was once going to give a lecture on the secret of eternal youth, but on the way to deliver the lecture he died. Still another yoga instructor, after giving a lecture, met with one of Srila Prabhupada’s students. The so-called yogi was sitting on a chair smoking a cigarette, and he said, “You know, I have been having a terrible problem. I just can’t give up smoking. Do you have any suggestions?” He was teaching yoga, but he could not give up smoking. Yoga means to control the senses, to renounce sense gratification, but although he could not even control his tongue, this rascal claimed to teach yoga. Is yoga such nonsense? “Surrender to Krsna. That is yoga. That is all,” says His Divine Grace Srila Prabhupada. For Krsna consciousness to act, therefore, there must be a bona fide source of information and a sincere soul desiring to know, just as in order for there to be conception, there must be a potent male and a fertile female. If a man is potent and a woman is fertile, then by their combination there can be conception. Otherwise, if there is no reciprocation, conception is impossible. One should ask questions and learn from a person to whom one can surrender. If one has any doubts about the person, then one should not waste one’s time, since one will not accept his instructions anyway. At the same time, a person who approaches a bona fide spiritual master with a challenging attitude will never understand the transcendental message. One who is fortunate enough to have found a bona fide spiritual master must hear submissively in order to understand and benefit. Bhagavad-gita demonstrates the transcendental relationship between Krsna, the supreme authority, and Arjuna, the ideal listener. This relationship is established out of respect and love, and only from this personal relationship is God realization possible. The student takes the spiritual master as his spiritual father and follows the teachings of the spiritual master to his full capacity. Lord Jesus Christ said, “Unless you become like little children, you cannot enter the kingdom of God.” Only to one who has full faith in the spiritual master will all knowledge be revealed. The word of the spiritual master is the life of the student, and everything else is secondary. Then there is contact. If one touches electricity, even if the source is thousands of miles away, the current is there, and one who touches it can always feel the blissful association of the Supreme Personality of Godhead.